The newest member of the DP Juza family is not only a woodworking veteran, but also a veteran of our Army National Guard! With 8 years of woodworking experience, he comes to us with extensive knowledge in all aspects of our process at DP Juza – from design and mill room operations to finishing and installation. 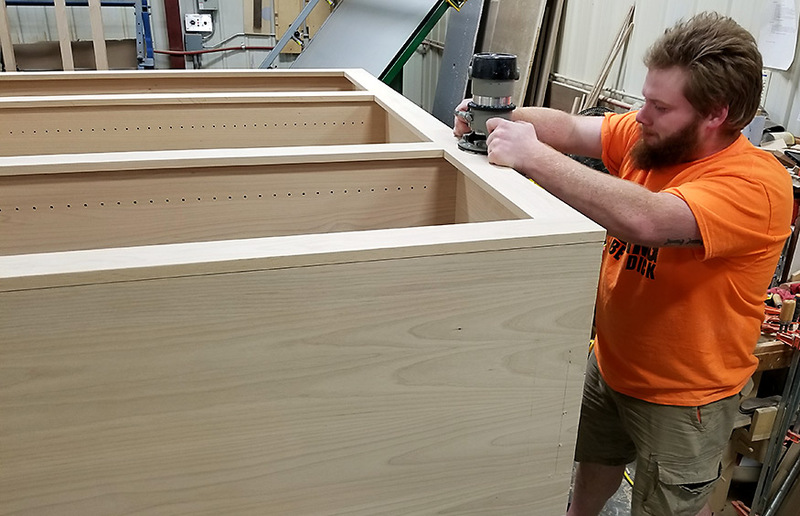 In his previous woodworking experience, Zach (also known as Lucky) developed great skill and knowledge in residential woodworking and cabinet making. Zach also has a knack for paying close attention to detail, which is exactly what we look for. Zach’s current role in the shop is in assembly. He takes all the pieces that come out of the mill room and puts them all together per the shop drawings at hand before sending them off to the finishing booth. Great attention to detail is needed when assembling units, large or small, and his keen eye for detail made him the perfect fit. It is his job to ensure everything fits together perfectly - the seams must be even, pockets must be strategically placed, and cuts must be clean and straight. Zach will surely grow to operate in all positions at our facility. From what we have seen, he is a rarity in a work force saturated with flakey, un-motivated and fickle millennials.